The Russian Air Force is to receive its first unmanned combat air vehicles (UCAVs) into service by 2020, with testing provisionally scheduled for 2017. Successful U.S. operations using drone aircraft in Pakistan and Afghanistan spurred Russia to revive its development program. The Russian Air Force is to receive its first unmanned combat air vehicles (UCAVs) into service by 2020. It is expected that state trials or field tests of the new UCAVs may start in 2017. According to Deputy Defense Minister Yury Borisov, research and development work for this project is now nearly complete. Drone fighters are able to tackle strategic tasks because they are difficult to detect and have better combat sustainability than manned aircraft. There are over 600 types of unmanned aerial vehicles produced in the world today, including 25 in Russia. A mere 20 years ago, Moscow was an undisputed leader in this field: In the 1980s, it manufactured 950 Tu-143 reconnaissance UAVs alone. However, the Defense Ministry then wound up drone production, since it no longer had either the money or ideological reasons to commission this type of aircraft. It was the Americans who prompted the Russian military to revive the program. Successful U.S. operations with the use of UAVs in Afghanistan and Pakistan have shown that no war of the future can be conducted without drones. All the more so since training an ordinary military pilot takes many years and millions of dollars, while creating a drone takes far less time and money. Furthermore, drones reduce loss of life. Personnel operating them are based well behind their troop positions and will never get hurt in fighting. Another impulse behind Russia’s drive to develop its own UCAVs was the 2008 war in South Ossetia. 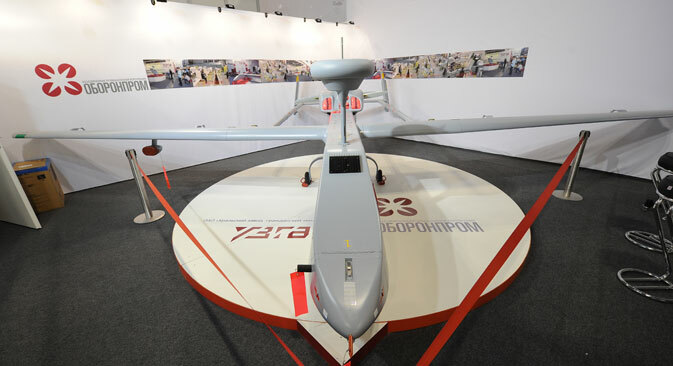 When the Russian Defense Ministry saw that the Georgian side was using Israeli drones, it concluded that this type of aircraft was essential for the new century. That very same year, the first tender for developing UCAVs was announced. It was awarded to several design bureaus. The Yakovlev design bureau presented drafts of an unmanned combat air vehicle called Skad. In its appearance and technical characteristics, it was very similar to the American Х-47 model. Its main characteristics were announced to be the following: maximum take-off weight, 10 tons; range, 4,000 km; a flight speed of at least 800 km per hour. It will be capable of carrying two air-to-surface/anti-radiation missiles or two smart bombs with a total weight of no more than one ton. There have been no further reports about work on that UCAV. The second winner was the Sukhoi design bureau with a project called the Х-40. There is very little information about it available. Its design is likely to "inherit" characteristics from the famous Su fighters and to become a prototype for a sixth-generation fighter. This is what Deputy Defense Minister Yury Borisov has indicated, hinting that the future strike aircraft will be created on the basis of technologies used in the fifth-generation fighter Т-50. The Т-50 meets the main requirement for modern fighters: high intellectualization, with a large number of devices all along the fuselage and wings, capable of independently analyzing flight information and adjusting the aircraft's mission input data. The aircraft has low-level terrain following capability and can, without human intervention, locate and classify air, ground and sea targets. The UAV market is enjoying a real boom at the moment, with leading air powers ready to invest nearly $55 billion in it (including $16 billion for purchasing the aircraft). In mid-February 2014, Russian Defense Minister Sergei Shoigu announced that the ministry intended to spend 320 billion rubles (about $8.8 billion) by 2020 on a program of supplying the Russian armed forces with unmanned aerial vehicles. It is not clear which specific UAVs this money will be used to purchase. All recent exhibitions of unmanned combat air vehicles for the Defense Ministry have consisted of two parts. The first is an open one, presenting tactical and semistrategic aircraft, which are frequently manufactured under license or use an imported component base. These are usually dual-purpose UAVs. The second is a closed one, where ministry officials have been able to see strategic aircraft. At one of such exhibitions, according to a source close to the Defense Ministry, Shoigu was shown a solar-powered strategic aircraft. The drone was so big that it could not be brought to the exhibition and was shown to the defense minister via a video link. Experts point out that the fact that some exhibitions are held behind closed doors indicates that Russia has prototypes that it is best not to publicize. All the more so, since a drone's main strength lies not in its aerodynamic characteristics but in the intellectual content of the software used to operate it.